Announcing Python Coding Camps and Classes. Python is an in-demand computer programming language, used by companies like G oogle and Youtube. Learn this versatile language and experience the power of computer programming in your hands! 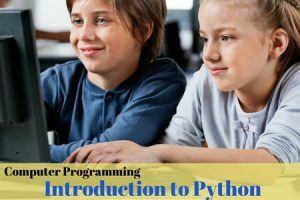 Our budding coders will learn the fundamentals of coding using the Python language and apply it to create simple games and applications. Creations include: Rock, Paper, Scissors!, Digital Fortune Teller, a store and an ATM machine. This new curriculum is being offered as track-out camps, summer camps, afterschool programs and Saturday classes. Check available programs in your area at stemforkids,net/register. For more details on our extensive line-up of computer programming and coding curricula for elementary and middle school students, see https://stemforkids.net/programs. STEM For Kids® provides the most comprehensive array of engineering, biomedicine, computer programming / coding, robotics, automation and entrepreneurship programs for children in grades preK-8 through summer camps, afterschool programs and classes in and outside schools. National and international franchise opportunities for this innovative children’s services and educational enrichment system are available. The STEM For Kids brand is generating significant national and international interest and has made into various “Best of ” lists including Entrepreneur Magazine’s Top New Franchises, Best Trends, Franchise 500, The Vangaurd List, Startup Magazine’s Companies Ready to Make you the Boss, Franchise Gator’s Franchise 100 and Americas Best Franchise lists. Business owners can start with as low as $20,000. Entrepreneurs looking for a low-cost entry into children’s educational services can learn more and apply at the STEM For Kids website https://www.stemforkids.net/franchise or call +1 866 991 7053. Schools and institutions looking to add innovative STEM / STEAM programs to their curriculum as in-school / in-house field trips or to provide afterschool programs and camps at their sites can request information at https://stemforkids.net/inschools/. For media inquiries contact as follows: STEM For Kids corporate office at franchisor@stemforkids.net.